At the U.S. Open, Abby Marshall (2037) had a breakthrough tournament, defeating three masters in the final three rounds. 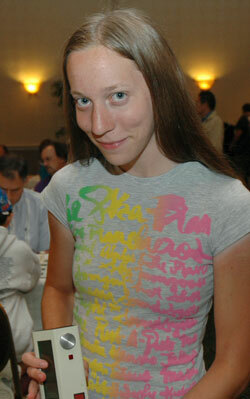 Here she blogs on aggressive women players, Cherry Hill hotel hunting and why she didn't defend her Polgar title. My first impression of Cherry Hill was that I had been tricked, and instead of being driven to the US Open, I was back at home in Newport News. In fact, the only thing that reminded me that I was not at home was that I could see Philly in the distance; otherwise, the rundown buildings, the construction to build more rundown buildings, gas stations, traffic, alarming regularity of pet shops, and general ugliness and atmosphere of nothing to do showed a depressing resemblance to my hometown of two years. You need a car to go anywhere, because even if you walk you are along the highway. Despite all this, The tournament site, the Crowne Plaza is a great hotel. It has very nice and spacious ballrooms for the games and a fantastic outdoor pool (it’s like a billion degrees here.) The restaurant is outrageously expensive, but luckily the hotel is within walking distance of several diverse, cheap places to eat: a Bob Evans, a pizza place, and a Japanese restaurant, just to name a few. Also, miniature golf is across the street. I'm staying at a nearby hotel which is not as nice. I could go on about the breakfast: frozen milk (even turned upside down and shaken for several minutes, no way was it coming out) and soggy donuts, or why the bathroom has to be swabbed twice a day with disinfectant, or why a man was carrying first a refrigerator, then a TV, from room to room, or what prompted my roommate Ettie Nikolova to say, after I banged my chair against the air conditioner, “You might as well break the AC, it will probably work better,” or why the alarm clock has to be on the floor (cancer rays), but I prefer to focus on the names. My personal favorites are Best Value Inn and Feather Nest Well. I prepared for round one by watching Die Hard and listening to one of the greatest albums in the world, Version 2.0 by Garbage. I felt inspired for my hard fought first game, and then I beat a lower rated player the second round and drew a master the third round. In the fourth game I found myself sitting across from a 2213 named Arthur Bisguier. I asked if he was a GM (“haha yeah about 50 years ago”), and he asked if I was a relative of Frank Marshall (“nah”). Wow, it was surreal playing him; I couldn't help staring and imagining that what he was thinking in our game were the same ideas used to defeat Fischer and such. After this, I beat two masters in the following two rounds, including a 14 move win against Eric Rodriguez in the final game. Abby in her last round game against NM Eric Rodriguez. I had two reasons for not defending my title in the Susan Polgar Invitational for Girls. My roommate Ettie Nikolova would be the highest seed and I would be number two, so if all went well, we would eventually play each other. So should the winner find a new room rather than risk staying with the enraged loser? A draw would be best, but then someone else could win it and we would both be mad…so basically I was having trouble sorting through these really important issues, and also I wanted to focus on the Open. Judging from my performance there, I made the right choice. I did play in the blitz and bughouse events, and I am now 18-0 in Polgar blitz side events, a ridiculous figure. I am not trying to get involved in some deep and ultimately pointless philosophical debate, but having played in the Polgar twice and now observing as a spectator, I really don’t think girls play any differently than guys. Discussions about girls having problems with being less competitive, aggressive, etc is crazy talk. Just because girls usually won’t look their opponent in the eye and say, “I will CRUSH you” doesn’t mean their competitive spirit isn’t as strong. In the blitz and bug events, I witnessed girls whispering malignant wishes, slamming pieces and using various subtle and ingenious methods of psyching out the opponent (huge sunglasses, evil stares), and even threats. I can't blame them: A win is a win, right?